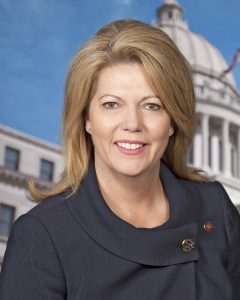 Senator Sally Doty is serving her 2nd term in the Mississippi Senate where she represents Lincoln, and Lawrence Counties; and portions of Copiah and Walthall Counties. An attorney, Senator Doty lives in Brookhaven and has a solo practice in Brookhaven. She is a graduate of Mississippi University for Women, and Mississippi College School of Law. Senator Doty has received an “A” rating during each year of her service from BIPEC (Business and Industry Political Education Committee). During the 2017 Legislative Session she was instrumental in the passage of Campaign Finance Reform and long needed revisions to the Mississippi Election Code. Senator Doty serves as the Chair of the Senate Elections Committee and Vice-Chair of Judiciary A Committee. She also serves on the Finance, Public Health, Public Property and Highways and Transportation Committees. Senator Doty is a valuable part of the leadership team in the Senate, and was appointed by the Lt. Governor to serve as one of 5 Senators on the Joint Legislative Budget Committee. Much of her work has focused on efforts to lower the rate of teen and unplanned pregnancy in Mississippi. Additionally, she has led efforts to pass legislation to protect victims of domestic violence. Senator Doty says that her most important job is Mom to her three children: Ellen, a graduate of Mississippi State; Sarah, a student at Ole Miss; and Ben, a student at Brookhaven High School.